Polymelia is a type of birth disorder that is quite rare, in this disorder shrunken limbs and arms are attached to the body parts. There are two basic reasons for this type of disorder, first it can be because of embryo developing in the fetus. The pair does not actually separate from one another and as a result one twin can degenerate completely. The other reason can be anomaly. Due to the anomaly there are chances that the child may have more than one limb. This disorder can occur in the womb due to improper cell division or proliferation. Polymelia is a Greek word that means "limb". It is termed as the type of birth defect that can generally involve limbs. Child suffering from the problem can have more than the usual number of limbs. This defect can be found in humans and most land-dwelling animals. In most of the cases person suffering from the defect can have five or more limbs. In this defect the extra limb is most commonly abnormal in shape and size. Mostly there are shrunken or deformed limbs attached to the body. It can be termed as the rare genetic birth disorder that is found in humans as well as in animals. There are some definite causes of polymelia. The major cause of this defect is the embryo. The embryo can start having conjoined twins. In most of the cases it is found that the one twin can degenerate completely except for one or more than one limbs. As a result there are other limbs attached, these limbs are considered as a part of other twin. There can be extra legs attached to the single body; the attachment of the legs is due to the body axis forking in the dipygus condition. As Polymelia is a birth defect, the symptoms are quite clear. In most of the babies that are born with the birth defect, it is found that the babies may have extra limbs and arms. There is no specific area in which the babies can have extra limbs and arms. 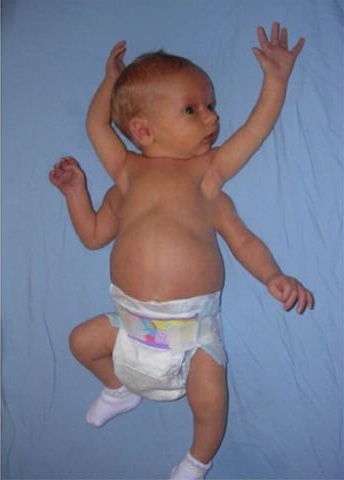 A baby with the birth defect can have the limbs and the arms on any body part. In some cases there is one limb or the arm. In rare chances the babies can have more than one limb and arms or both. Sometimes there are small extra legs between the normal legs. There are treatments available for Polymelia. Surgical treatment is the only way to deal with such type of the problem. Using the surgical technique the extra limbs and the arms are removed from the body parts. However there are number of tests that are suggested prior to the surgery. The surgery can take few hours to complete because the limbs may grow at any sensitive part of the body. In most of the cases, there are legs attached between the legs, in that case precise surgery is required to order to remove the extra limbs and the arms. But as a result of the surgery there may be disability and other complications.